Now that we're more than a fortnight into 2017, it's time to see if we can discern some direction in the market. For example, there has been tremendous strength in the restaurant space, particularly casual dining and fast-foods plays, Jim Cramer said during his Mad Money program's "Off the Charts" segment. To get an accurate picture of which companies in this space have strong money flow, good volume and robust price trends, Cramer turned to Bob Lang, founder of ExplosiveOptions.net and the technician in the three-man, all-star team behind TheStreet.com's Trifecta Stocks newsletter. Lang's analysis of the fast-food sector uncovers four strong companies. Leading the pack is Popeyes Louisiana Kitchen (PLKI . According to Lang, Popeyes has perhaps the strongest chart in the entire fast-food segment. First of all, notice how the stock soared into the stratosphere right after the election. 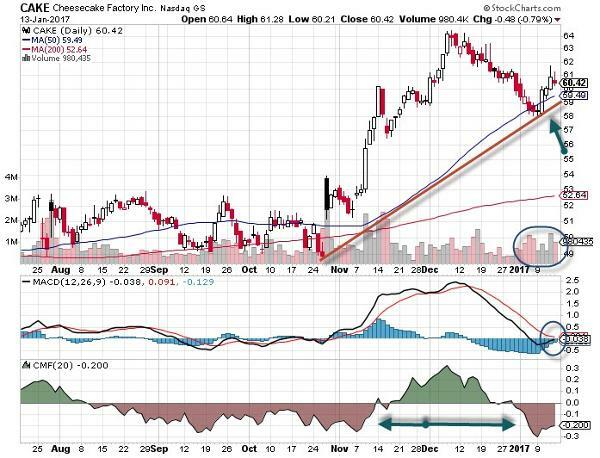 Since then, Popeyes has been trading sideways, that is, consolidating at a higher base, a very positive sign. Basically, the shares have been building a base for their next leg up of the rally. 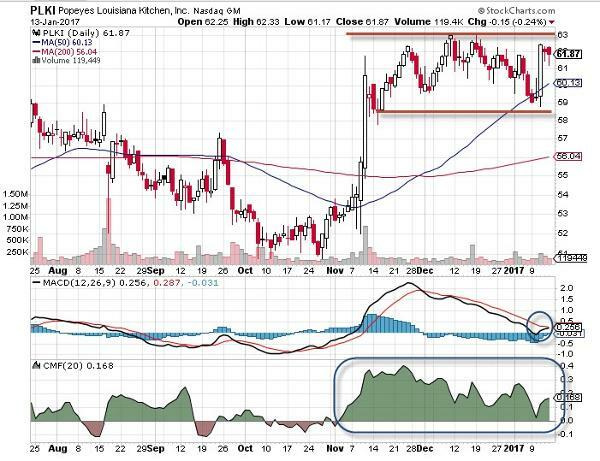 Sooner or later, Popeyes is probably going to break out above its ceiling of resistance at $63 -- also its all-time high -- and after that Lang expects it to be smooth sailing. Notice the Chaikin Money Flow oscillator at the bottom of the chart. This is an indicator that measures the level of buying and selling pressure in a stock. In other words, it gives a sense of what big institutional investors are doing. In the case of Popeyes, this oscillator shows that big institutional investors have been accumulating shares despite the share price not moving much. Consider the Moving Average Convergence Divergence indicator (MACD), a momentum tool that helps technicians spot changes in a stock's trajectory before they happen. 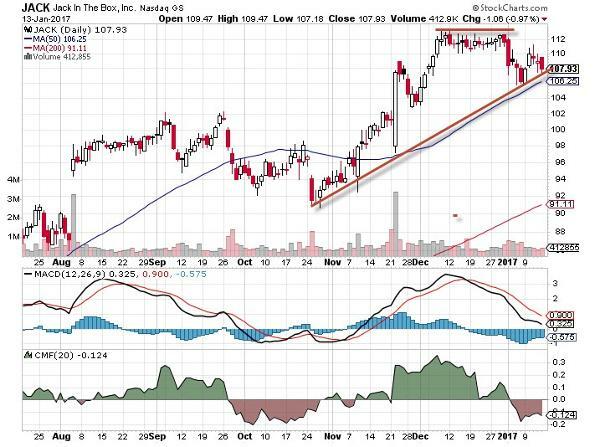 With Popeyes, the MACD just made a bullish crossover -- where the black line goes above the red one -- and this is one of the most reliably positive chart signals. Put it all together, and Lang thinks Popeyes stock could rise to $75. Lang also likes Cheesecake Factory (CAKE - Get Report) . Shares have retreated from big gains just before the election, but that retreat ended last week as the stock found a floor at its 50-day moving average. While the Chaikin Money Flow oscillator is still negative for CAKE, that doesn't really worry Lang given that the stock was pulling back until pretty recently. Lang points to the MACD indicator, which has turned up and looks ready to make a bullish crossover soon. Add to that CAKE's high-volume rally last week and Lang expects the shares to test their former highs. The Jack in the Box (JACK - Get Report) burger chain, which also owns Qdoba, has benefited from the struggles of Chipotle Mexican Grill (CMG - Get Report) . Jack in the Box was the best-performing restaurant name of 2016, up more than 50% last year. Although it was overbought late last year it only suffered a 5% pullback, said Lang. Lang says the shares have a pattern of higher highs and higher lows. While it faces a stiff ceiling of resistance at $112, Lang believes it can blow through those old highs and continue its post-election uptrend. 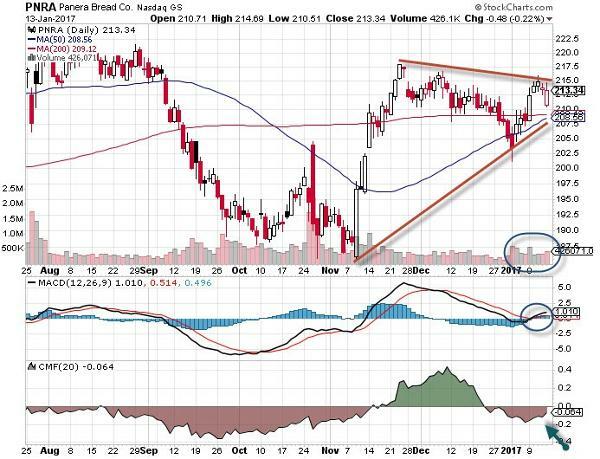 A fourth restaurant stock Lang likes is Panera Bread (PNRA , an Action Alerts PLUS holding. He thinks shares are at an inflection point, meaning it's either about to break out to the upside or just break down. He believes an upside move is a lot more likely because the stock has resumed a pre-election rally. While the Chaikin Money Flow oscillator went negative here, it's starting to turn up, although we need a few more up days in 2017 before it will go totally positive. On top of that, the MACD indicator flashed a bullish crossover a couple of weeks ago, another positive sign, Lang said.